Devotees should assembler in front of Parakamani which is North-West corner of the sanctum. Archaka will have list of names and reads the list of Vastralankara Seva ticket holders by names. For the Vastram Alankara Seva two persons are allowed per ticket. Later Gruhasthas were given with empty silver vessels which is to be carried in procession around the sanctum as a mark of honor and the same was handed over near the sanctum. Vastralankara Seva ticket holders to be seated right from first door. Ladies were made to sit to the left side of Lord and gents to the right. This is the most sanctifying ritual in the Agamas that is performed to the Moola Virat every Friday morning. Abhishekam was done first with milk which is brought from T.T.D Dairy, then with water, Chandam (Sandal paste), Turmeric, Kasturi, Civet-Oil and Paccha karpuram ( Refined Camphor), to the accompaniment of Vedic hymns, Purusha Sukta and mantras. 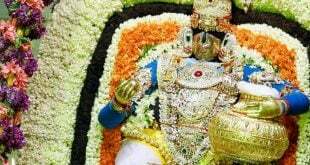 The Lord was then dressed in a Pattu Pithambharam followed by Darshan. A packet of Kasturi Chandanam that was placed at the feet of Lord and Paccha karpooram applied as Namam to Lord was given as Abhisheka Prasadam to the Gruhasthas. 1) High level recommendation letter is required to obtain this seva ticket. 2) One should Submit recommendation letter at J.E.O Camp Office by providing active mobile number. 4) Gruhasthas can collect tickets from MBC-34 by displaying SMS and ID card. For any queries with respect to Vastralankara seva, please leave your comment below. you need to get high recommendation letter from MLA or MP . 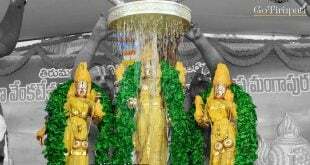 I want to visit the Lord venkateswara through vavastraalankarana seva. Kindly arrange and allow me. I can’t submit any recommendations letter. You need to get high recommendation letter and need to submit at JEO office one day in advance. Is 11 year boy allowed in malchat Vastram seva?